The sucking toilet swirl that is Duke Nukem Forever and lower-than-expected sales of L.A. Noire have taken a pretty big bite out of Take-Two's stock value. The release of L.A Noire, Rockstar's latest magnum opus, coupled with the decade-late-but-still-anticipated launch of Duke Nukem Forever, must have looked like can't-miss good news to everyone at Take-Two Interactive. That expectation probably makes the recent slide in the company's share value even tougher to swallow, because those are the games being blamed for it. Take-Two's share price fell by more than four percent yesterday and while the company remains up more than 20 percent for the year, it's slipped by over 15 percent since mid-May. Two factors, according to MarketWatch, are likely to blame: first, while L.A. Noire was the top-selling game for the month, it managed only 899,000 unit sales, a very impressive mark but well below the one million unit sales predicted by some analysts. It's also way behind the 1.5 million sales of Red Dead Redemption, which moved roughly 1.5 million units over the same period last year. And then there's the Duke. Despite all the hype, not to mention a development cycle that stretches back into the 90s, Duke Nukem Forever has been almost universally panned by critics, notching a Metacritic score of 49 on the Xbox 360 and 57 on the PC and PlayStation 3. That's "unmitigated disaster" territory right there. 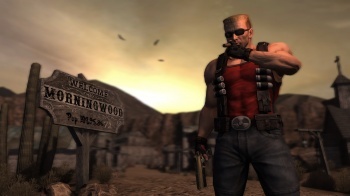 In an investors note issued yesterday, analyst Doug Creutz of Cowen and Co. said the "extremely poor" reviews of Duke Nukem Forever are one reason why he now believes that the likelihood of Take-Two achieving its year-end financial target "has been significantly reduced." So much for betting on Duke, eh?